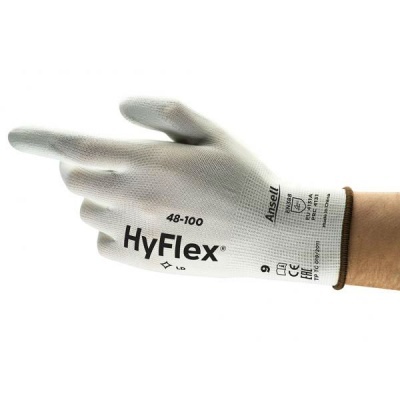 There is not a better choice on the market for light industrial applications than the Ansell HyFlex 48-100 Palm-Coated Light Application White Work Gloves. With a highly useful lightweight and dexterous design, it is the excellent strength of these gloves that sets them above the rest. They guarantee outstanding grip and protection across a variety of industries that range from automotive, to maintenance to transport. The Ansell 48-100 White Work Gloves are available in six sizes that should suit the hands of most users. Please measure the circumference of your hand around the knuckles (excluding the thumb) with your hand open and your fingers together, and the length of your hand from the tip of your middle finger to your wrist. Good close touch gloves with great tactile conductivity. Durable and terrific value! Get some! !